If ever a Hollywood movie should be based on a Poker machine, rather than the other way around, it should be IGT’s Firehouse Hounds. Although the symbols on the reels may be a little basic, there’s animated Dalmatians running around the screen up to various cartoon style antics, in this 5-reel game that comes complete with stacked wilds, free spins, bonus payouts and wins that pay from the left and right sides. Set in the streets of an unnamed American city, it’s been cleverly designed to look like the reels are in the windows of a brick building, and behind it there’s tall buildings, while in front of the building a couple of sleepy firefighting dogs are slowly getting ready to tackle their next job. It’s a great looking game and like all IGT pokies, it’s got the guarantee of reliability and fair payouts to make it a pleasing experience to play. The symbols are arranged in 3 rows, with 30 paylines running across the reels. As winning combinations can start at either end, players effectively have 60 ways to start a line and any time 3 or more matching symbols turn up across one, on adjacent reels, they will win a prize. The minimum stake is 0.10, with players able to raise their bets to 40.00 per spin, all controlled via the buttons below the game that also give them the option to spin the reels automatically or adjust the quality of the graphics to suit their PC or mobile device. A detailed paytable list how many times the line bet will be paid out for each win, starting with firefighting equipment that makes up the lower value, and therefore more common, wins. An axe and the hose each pay 5x, 15x or 75x when landing on 3, 4 or 5 reels across a line, plus there’s a fire extinguisher, lunchbox filled with bones, fire hydrant and then a red fireman helmet that’s worth 10x, 25x or 150x.Players win more by lining up the number 7 symbols, with yellow and green ones being valued at 15x, 30x or 200x, then there are purple and blue 7’s, topped off by a white and polka-dotted 7 that pays 50x, 150x or the jackpot of 500x when it fills a line.Any full line of 7’s of any type, will be worth a win of 40x. The frequency of wins can be boosted by a purple wild symbol, that substitutes for all others with the exception of the bonus icon if it’s possible to create a winning line by doing so. The firedogs in front of the reels can spring into action after any spin, hosing down reels 1 and/or 5 to turn them fully wild, which can go a long way to completing wins. The bonus symbol is the fire alarm bell, and when it stops in any 3 positions, players will win a prize equal to 30 coins, followed by a trip to the fire station where they will see 3 firepoles.By selecting one of them, 4, 5 or 6 free spins will be awarded and during these, reels 1 and 5 will stay fully wild. As wins pay from both sides, there’s a good chance that multiple wins will be had in the bonus games, even though only a few spins are played out. Any 3 or more bonus symbols will retrigger the round, with the new spins added to the end of any still left to play out in the current session. Different reels are used during free games, with nothing awarded for 4 of a kind lines, as having 2 wild reels means they can’t be created, just 3 of a kind or right across to 5 of a kind lines. 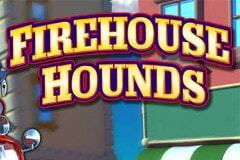 Slick animations and fun cartoon canines certainly make Firehouse Hounds a good-looking pokie. It’s got plenty to recommend in the way it plays as well, from the colourful pictures of firefighting equipment to the rich variety of 7’s that bring in the bigger rewards. By having lines pay both ways, players should find it easier to line combinations up for a prize, helped by the dogs dousing reels 1 and 5 in wild symbols which means only 2 more matching symbols are needed for a win.The free spins may consist of just a few games, but they can be fairly rewarding and like all IGT pokies, there’s a decent return to player ratio. If there are any criticisms of Firehouse Hounds, it’s nothing much, maybe a few more dogs featured on the reels instead of 7’s would have been nice, but that’s just a minor observation and really not a biggie.